Palazzo Barion, located in Via Paisiello 56, is a 4-story building. One floor is a mezzanine, whilst we also have a terrace, built in more recent times and restored by Arcangelo Santamato to become an elegant B&B that enjoys one of the most beautiful views in front of the Great Sea natural harbour. Surveys are currently being carried out in regards to the origin of the building but, thanks to the exam of the original flooring that came to light during the property restoration, it may date back to the half of XVIIIth century. Like so many of the noble properties located in “Via Paisiello”, looking out along “C.so Vittorio Emanuele”, the so called “Ringhiera”, this building was also risen up on some Middle Ages ruins. These are easily visible in the Hypogeum compartments (100 m2 around) situated six meters under the existing pavement and under the original stone block, along the highest natural surrounding wall of the acropolis in front of the Great Sea. The Santamato Hypogeum seems to have been built over several ages as shown in different areas. Where the hypogeum declines at the end of the left side, there is a first room with a ceiling that has a barrel-shaped vault and three basement windows overlooking Via Paisiello. The basement windows were typical breaches that allowed light and air into underground areas and provide access for goods and materials. It’s also thought that this area was used as wheat storage (Foggia). 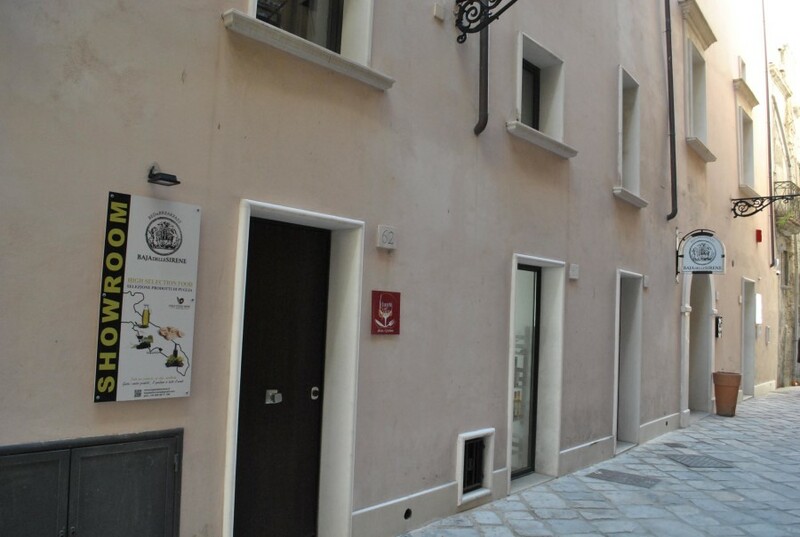 In ancient times, our street was called “Via delle Fogge” with three basement windows looking out onto the “Ringhiera”. 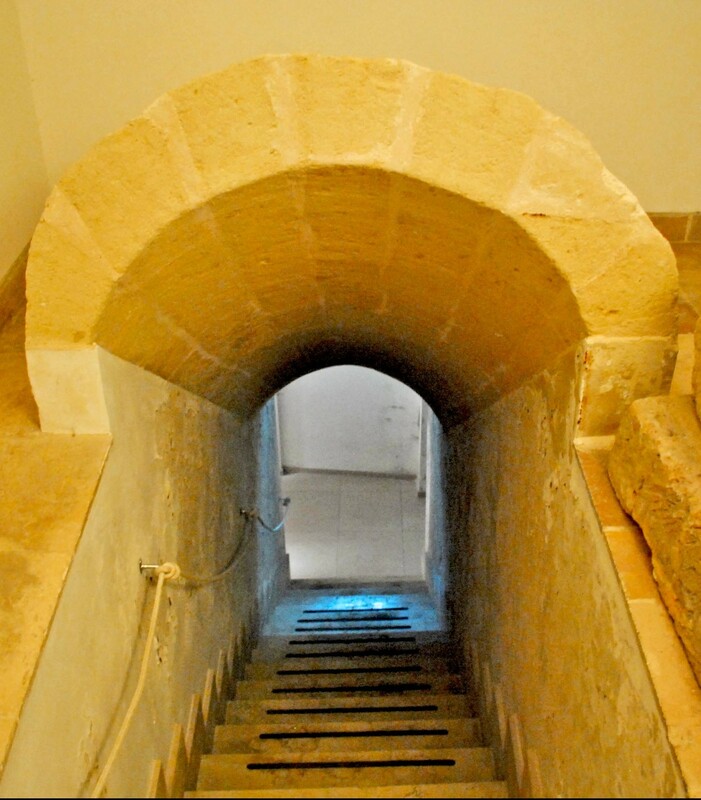 A passage, characterised by a beam which shows how the Hypogeum was used as a storage, leads to a large barrel-shaped vault living-room and probably dates back to either XVIIIth or XIXth century. Here the arches structure, overlooking the entire room which nowadays hosts toilets, is a typical construction of the Middle-ages. And in the middle of the wall situated under the “Ringhiera” – the ancient “Via delle Mura” – had to be the antique gateway. In the middle of this living-room, there is another arch-shaped passage leading to the only space which seems to be the first hypogeum of this complex construction, kept unchanged since the first structure and for this reason more fascinating. After a first glance, it seems that this area had been used as stalls in the Middle-Ages. However, after a more accurate survey carried out by Dr. Silvia De Vitis, some doubts arose. In fact, another theory claims, due to the original very low floor and the perfectly concave-shaped surface similar to San Pietro di Crepacore located at Torre Santa Susanna, it was a worship area constructed in the Early Christian age. In addition to that, it seems to be the first discovery of a cultural early Christian age construction located in the highest western side of the island. Furthermore, another worship area, remarkably very similar to the “Santamato Hypogeum”, has also been discovered digging out under the “Castello Aragonese”. This new one has still to be architecturally studied. Trust the sea and its tidal chant. Awaken your emotions! A.S.